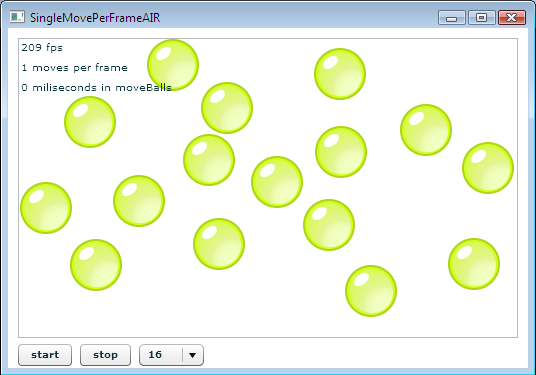 Bubblemark is a popular benchmark for some of the RIA technologies including Flex, Adobe AIR, Ajax (DHTML), Java Swing, Java FX, Silverlight, etc. I’ve been trying for a while to create a new Flex version of Bubblemark to show just how fast Flash Player and Adobe AIR are. But I’ve come to a few realizations… First, you can make benchmarks say whatever you want them to say. When trying to optimize Bubblemark I found a few interesting things. First was that IE (and some versions of Firefox) limit the frame rate of Flash Player (and possibly other plugins). This means that while the Flash Player VM might be able to actually achieve 200+ frames per second the actual visual result might be only 60 fps. And maybe this is for good reason. Why do you need a visual frame rate faster than the refresh rate on a monitor? You don’t. And especially not for RIAs. Graphic rendering performance is certainly relevant for RIAs but that is only one factor which affects overall application performance. As Chet Haase points out, Bubblemark lumps a number of different factors – calculation speed, rendering performance, and timer resolution – into a single “frames per second” metric. That leads to my second realization. The frame rate of bouncing bubbles isn’t very relevant to RIAs. As Josh Marinacci of Sun says – “there aren’t any real benchmarks yet for rich internet applications.” I think that my Census RIA benchmark is more pertinent to RIAs than bouncing bubbles. Census benchmarks how quickly an application can get data from a server, parse that data, and render the data in a datagrid. Sorting and filtering are also important benchmarks that I’m working on integrating into Census. Today the Census app has various Flex and Ajax tests but I’m also currently working on adding a Silverlight test, an Ext JS test, and an updated Dojo test. I’d love it if someone would create a Java FX version as well. Benchmarks are only useful when you apply them to your scenario. Is the performance good enough for what you need? Are your users able to run what you build? There are thousands of RIAs which run in Flash Player and now hundreds of Adobe AIR applications. For the millions of users of these applications the frame rate is fast enough and the VM performance is superb. For the developers of these applications the Flex tooling enabled them to efficiently build these applications. Not only do the runtimes and the tools work on Windows, Mac, and Linux – the runtimes and core development tools are free. There is more to choosing a platform than the speed at which a runtime can bounce objects around the screen. Sorry if I’ve burst any bubbles.